The Land of Muggy Map . A modern processed version of the map showing the early Kingdoms- click on the map to see a larger version. Higher resolution version click here. The Land of Muggy is in a universe of different Stars and constellations and has no moon- the calendar is therefore different from ours. 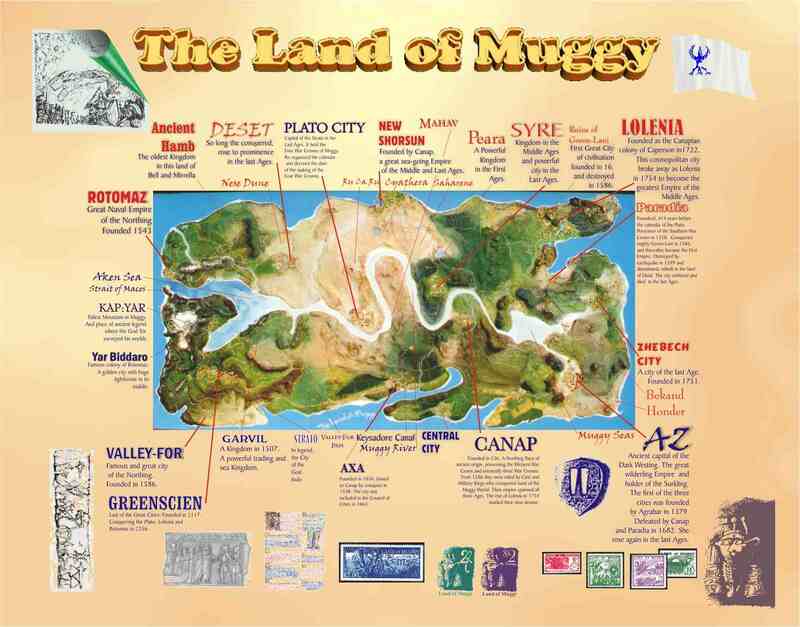 The Map of Muggy section is designed to inform you about the Map, where the Land of Muggy is on a globe, its compass regions, geographical features, past geology and how it was made and has been restored. The Land of Muggy has been a private undertaking for nearly forty years. Its publication into the realm of fantasy is due to encouragement from those are fascinated by the whole world of it- and frustrated that the authors have made no effort to publish it! Until now! The existence of the World Wide Web is a perfect vehicle for The Land of Muggy. There is no shortage of material that can be published, it is only a question of what and when- and what you might request. I hope you enjoy this fantasy world. The panel above left is taken during restoration. THE ATLAS; This is being developed for CD format as well as book and postaer forms. The Atlas will also contain a new star map and feature several of the older maps recently restored such as the Linear Maps and circular Maps from the First Ages. The project will be issued in parts as each map-sequence is completed and viewable in your browser or Word 2000.It will also contains tracks of illustrated historical narative. To show your interest in the project send us an email. The map to the right is the poster giving various historical details. The Land of Muggy Map was created in 1963-64. This special map shows the Age of Kingdoms as they were in the East. It spans three panels over nine feet long and three feet high. The Map has been restored three times and work is now almost complete on the fourth restoration. The New Wall Map is nearing completion- here is a preview. Click on the left poster for a medium resolution view. Click on the right for a high resolution view. The Land of Muggy Map is not a mythical or theoretical place mixed in with real landscapes, but rather a deliberate work of fiction and imagination. Most Fantasy Maps are made to accompany stories- after they were written, instead the Land of Muggy Map was made as a game first! It was a world of Conquest and Empire to amuse myself and my brother in 1964. But before long it attained a history and languages; and had heroes and stories. Eventually some of the stories became a written history and from there emerged novels of which the Surkling belongs. 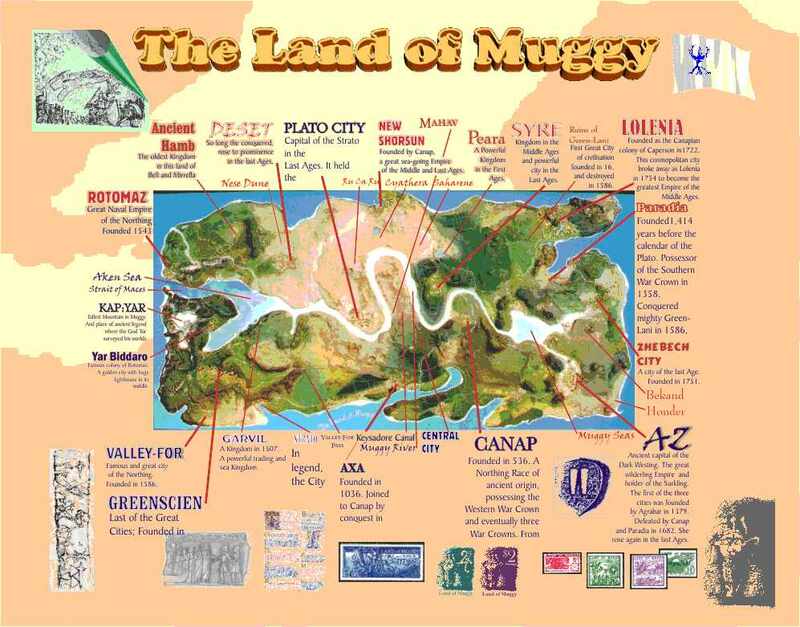 So the Land of Muggy Map exists- in this world and as the photograph shows above, as a geographically three dimensional landscape, containing rivers, seas, plateau, and mountains. Upon it are ruins of towns and cities that existed before those of the Last Age of Muggy. Geoff Weston as author working various maps. To the left is the black & white photographic map. Top is the No3 map. Such maps are used to document the different Ages of Muggy History. Literary Archeology is the study of legends, stories and history to compile a complete knowledge of the Land of Muggy. The concept of the Map of Muggy was Empire and Conquest. Many such games had been played before on smaller maps. They were wooden bases with plasticine clay for the terrain. The sea was usually left the colour of the wood. 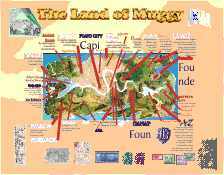 The map of Muggy was based on three panels of ten ply card board. This was overlaid with the same card shaped to layers that formed the insides of the plateau and uplifted areas. One thing that had not been available before was terrain. where rivers and lakes could be at different levels so forming highlands and lowlands. This technique allowed uplands and lowlands. This was then covered in plasticine of brown- a mix developed from many colours. Before this was laid the minerals were seeded by the random submersion of different coloured metal foils- gold, silver, bronze, blue, green- and so on into the plasticine clay. These would be the mineral deposits. Over laying the terrain. was done with oil pastels that provided forest, field, desert, snow and rock. The mountain peaks originally had carbonate of Soda for snow. The seas were painted blue and the beaches were white plasticine. The walls of the villages and towns; and the buildings themselves were at first molded from the ground. These were the very early civilizations and they have by and large remained- except where conquerors sacked them- they have been overlaid with pastel again, or built around by cities. Herein lies the archeology, for not only are there fields and forests to be uncovered but ancient cities. Later villages and towns were made of paper stuck with plasticine to the ground. They were in a variety of colours. And as walled cities and Kingdoms grew up the buildings became qite complex. The Map has been restored three times. Originally names were attached by small paper written in pencil- some of these still remain- under the pastel. However, the modern practice is to remove these and restore a Map with nothing else but Terrain and civilizations. There will flow from this maps and charts. The earliest maps we have are from the hand of the Wilderfolk but these have been lost as complete maps. Some fragments existed in the great library of Paradia and Mayhav but they were only part of an earlier collection of material by the White Shield. They called them the Coril-Scrolls. It was from them that the first detailed maps were drawn of Muggy. They are therefore part legend. One of the great collections of maps- and calendars was the Coril in the library of Paradia. This was collections of old maps, and maps drawn up from legend accounts. Many are of much earlier times and suggest a different world altogether. In those days the Sea of Muggy was thought to be the middle of Muggy and the stars. Therefore these maps are fanciful and revolve around the Gildo and are somewhat distorted. However, the Salger map does show the path to the City of Canap- a famous city in the Land of Muggy. This map was long and really just a series of points joined by their path. It was important because Salger Prato called it the Letter of Days and Nights. From it the first calendar was derived that became the Paradian Calendar. The earlier map was held there together and many copies were made, all different because it was the teaching tradition to copy his works and they became increasingly fanciful. They became known as the White Shield Maps. Where is the Land of Muggy? Well, we do not know exactly where it is in the universe. Wether itis in our galaxy or another? Its location is all in the stars and legends. And what is the solar system like? And what about the planet itself? What is the wider geography? While you read about The Land of Muggy these questions will haunt you. Write to us about it, we would like to know what you are thinking and maybe put you right! Or maybe not!